The project, Le District, will contain an open market with multiple specialty kiosks and food options. 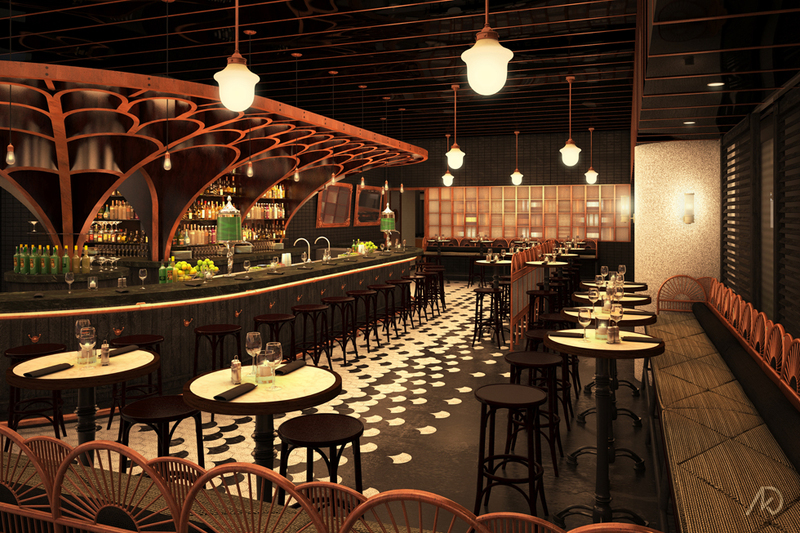 These renderings show one of the restaurants within the marketplace. 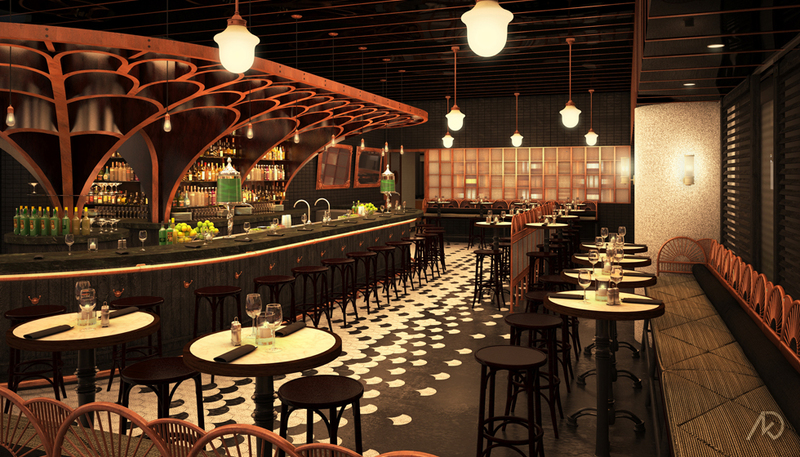 This absinthe bar will have an old/rustic/industrial feel while serving absinthe in traditional drips. There is also and an outdoor dining area which will provide seating along the open plaza with a view to the marina. I have also shown an early concept rendering for the interior, which shows a slightly different design. All items in the scene (except for a few whiskey bottles) were modeled, textured, and lit by kk. This image shows the latest design for the main dining room, which is located on the corner of the site to allow in a great deal of natural light from the exterior. The large high banquettes help to define the space while the bar/back bar canopy provides a focal point. 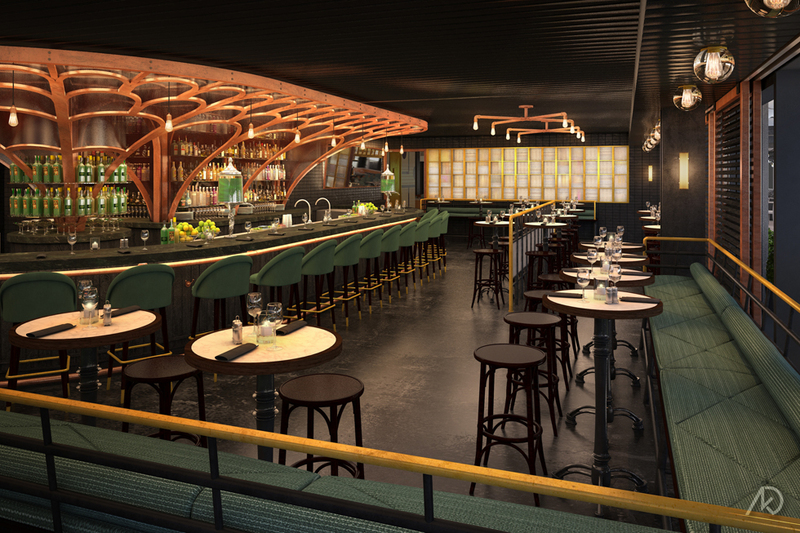 The final design for the back bar canopy uses a steel cage structure with a mesh infill. This image shows an early design for the main dining room. The bar/back bar canopy became visually heavy within the space, so the design eventually used a mesh infill to lighten the look. Other features such as the banquette backs did not go over too well and the newer designs moved away from anything that looked too old fashioned/saloon-ish. 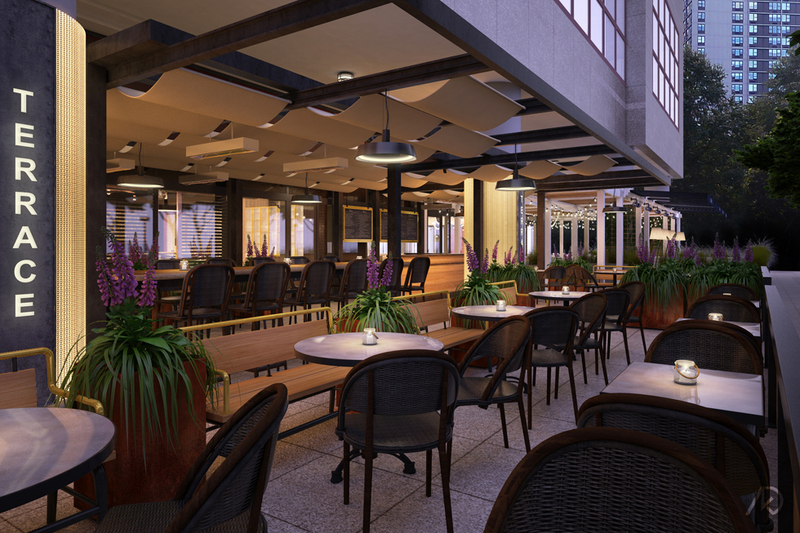 This image shows the latest design for the outdoor dining area. The space has large high-top communal tables as well as lower more intimate seating options. The space is to remain relatively open to provide for more interaction. Only small planters provide some division of space, otherwise it is a very communal happy hour spot.